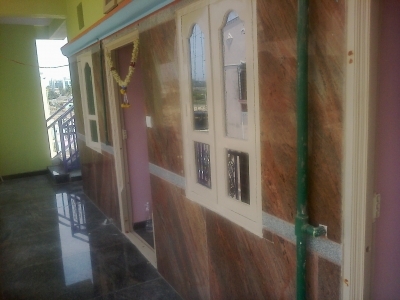 Granite Cladding is one of the method used by people to improve the appearance of the house. It is one time activity while constructing house. once it is done no need to do the painting. For cladding we went with 1 feet * 2 feet tiles which is 10 mm size. 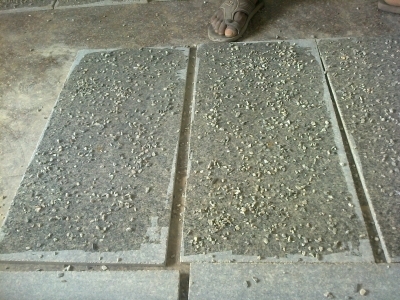 people will go with 20 mm size slabs which are bigger in size. 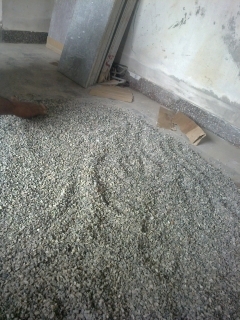 This time we went with small stones which are available in rock dust. We separated small stones from dust and kept aside. Get Araldite from hardware shop. Araldite is a Epoxy adhesive, for that you need to add hardener. Before start of the cladding process, you need to mix both of the liquids, apply the mixed adhesive on back side of the granite tile and place chips. Leave this tile at least a day for drying. After this this is ready for use. Granite tile back surface will be smooth. By this process we are providing the grip for the back side. 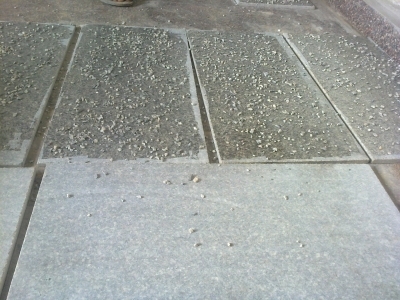 When ever you apply cement on back side it will hold granite tile strongly. So that cladding will not come outside even after years.